Do you need a large piece of art ? Do you have a large wall or multiple walls at home (or work) that you really would like to buy a great piece of artwork or panoramic landscape photograph for ? The wall still remains blank because you are concerned that what you purchase may not be the best dimensions or colour tones for your wall, or it just wouldn't look 'right' ? Do you see some nature photographs / panoramas / landscape photos / photo collages or artworks on Lucy's website that you really like ? Tell Lucy what photographic artworks you like from her website & she will come over with sample photo canvases & artworks, with her catalogue & tape measure to work out some suitable options that suit your taste, fit within your budget & work with your wall space & colour scheme. Custom sizes and colour tones can also be incorporated with all photos & images available on this website. Lucy can also take a photo of your wall space and superimpose the artwork so you can get a good idea of how the artwork will look. Framing, canvas printing & mounting options can also be discussed. Lucy has worked as an interior designer & architect for the last 10 years so has had extensive experience dealing with composition, proportions, colour & detail and along with her printed 'image on glass' splashback business, she is often called out to many houses to help clients choose the best artwork (or splashback image) for their space. 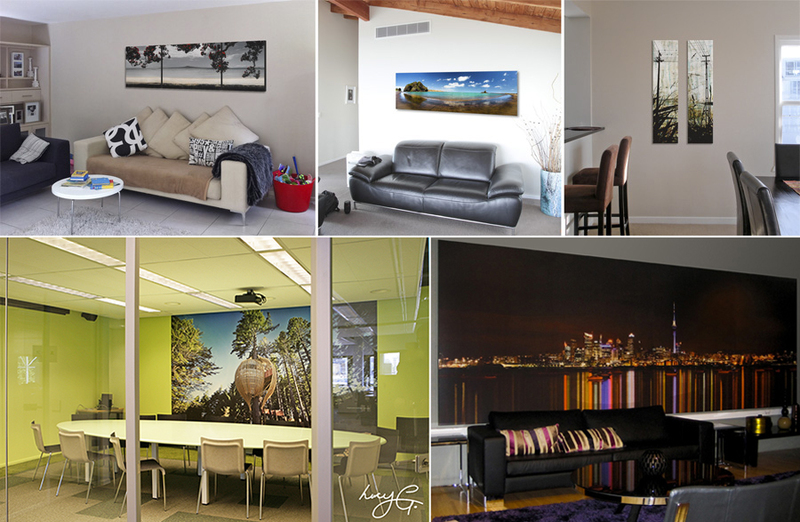 Below are some examples of client's wall spaces with panoramic images / canvas artworks superimposed. Images that will print to 1.8m (and some even larger) can be found here. Book an art consultation NOW ! Home or office art consultations available within Auckland City & at locations within 20 minutes of Auckland CBD. For all other locations feel free to email Lucy a photo of your wall space and Lucy will call you to discuss suitable options. Please include several days & times that would suit you (either during the week day or weekends) and your name and address & Lucy will ring you to book in a time and discuss what landscape panoramas or artworks you like & what to bring along !